Pamper yourself in this 2018 Chrysler 300 S with Navigation System, Beats Premium Sound System, Panoramic Moon Roof, Blind Spot Detection, and Appearance Package! 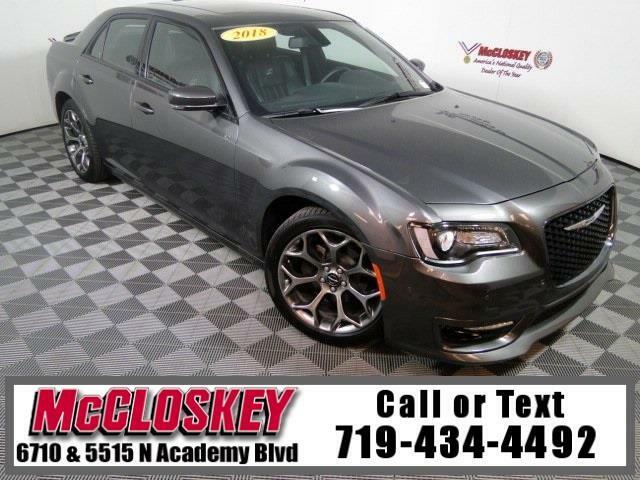 The sport-oriented 300S comes with 20-inch wheels with performance tires, a sport-tuned suspension, heated and power-adjustable front seats, leather upholstery, LED foglights, remote start and transmission paddle shifters. The V6 is exceptionally smooth, and the gas pedal is responsive to your inputs. The eight-speed automatic is rarely confused, even handling hills with smart downshifts. The reason the 300 is so big on the outside is because it's so spacious on the inside. It gets high scores for ease of entry/exit and overall passenger volume, plus it has a big trunk. This vehicle passed our 110 multi-point inspection and is backed by our National Quality Dealer of the Year Award. We are an ''A+'' Better Business Bureau Rated Business. We offer low interest rate financing, low down payments and the highest trade allowances in the state! Here at McCloskey we do things a bit differently, we shop our competition every day to ensure a great value to you. Come on down and experience it for yourself. This McCloskey Assured vehicle includes a 2 month/2000 mile Warranty and a Vehicle History Report!! At McCloskey we strive to provide ASSURANCE, TRUST, VALUE AND QUALITY! Call 719-434-4492.